Within Zion national park, there is a small, little known creature named the ringtail. It is related to the raccoon and is completely nocturnal. With big eyes, bigger ears, and a black and white striped tail, they seem like a fairy tale critter. 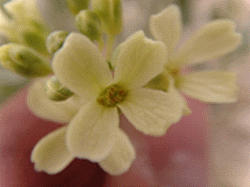 However, they are very real, albeit elusive and extremely smart. They are about the size of a house cat and spend their time hunting for mice, lizards, bird eggs, and insects while also foraging for berries and seeds. They are quite adaptable mammals, changing their diet to suit their surroundings. 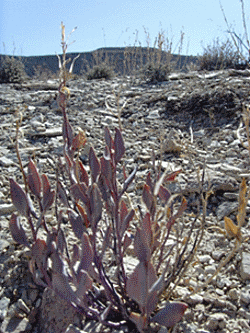 They can be found throughout the southwest and western coastal states from Oregon to Texas, in all sorts of habitats. 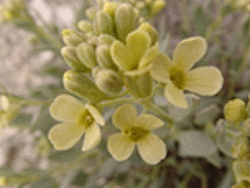 However, they are rarely seen, so their presence in the desert of southern Utah usually goes unnoticed. Many residents of southern Utah don’t even know that ringtails exist, let alone live in their back yard. A relatively large population of ringtails exist in Zion National Park, one of the most heavily traveled national parks in the US. Last year, alone, over 3.6 million people visited the park. Those tourists and visitors often eat packaged and pre-cooked foods while in the park, disposing of their trash in proper receptacles or, rather irresponsibly, along trails and campgrounds. 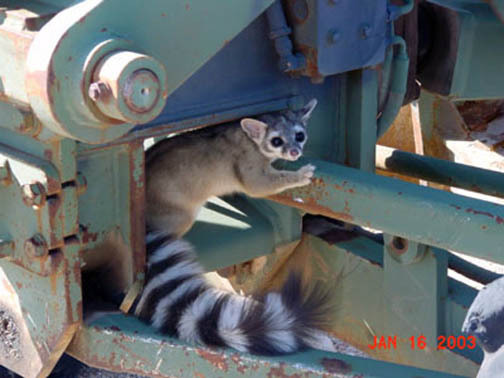 This creates ample opportunities for ringtails to gain access to human food, such as trashcans, and may encourage them to forage for food around campsites and visitor lodging. This behavior is a problem for the guests and employees of Zion National Park, but it is also extremely problematic for the ringtails in this area. The consumption of human foods and trash items are creating a significant shift in the composition of the diets of ringtails in this park. Researchers at Utah State University collected scats from ringtails in the park to analyze what they were eating. While the scats collected far from human buildings and activity showed the diet that is expected for wild ringtails in this area (e.g. insects, plant material, and some small rodent remains), the scats collected around and inside human buildings told a much more disconcerting story. There was trash and non-digestible food items present in over a third of the scats collected. These items perhaps could be due to the wrappings of human food, such as napkins, or they could be a byproduct of trying to gain access to the food, such as eating foil candy bar wrappers. A lot of human food is accessed through improperly sealed trash containers, poor food storage in campsites and cabins, and potentially hand feeding, all of which put the ringtails at risk for dietary problems, behavioral problems, and possibly death. The ringtails are also coming towards buildings in the communities around Zion National Park, such as Springdale and Rockville, to seek easy shelter in the colder months, something that is not necessary for their survival. Properly sealing homes, particularly attics, in the areas where ringtails occur will prevent the ringtails from entering the living spaces of humans, and gaining access to food items dangerous to them. It will also prevent the homeowner from dealing with the aftermath of having a ringtail take up residence in an attic or crawlspace. 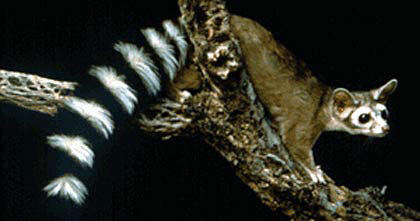 Any hole larger than 2″ in diameter is enough to allow an adult male ringtail to enter. Surveying a house’s foundations and siding each fall to identify any such holes, and fill them in, can go a long way toward preventing ringtails from entering a home; helping ringtails practice healthy, wild behavior. Ringtails are a certainly a wildlife sighting to remember, but make sure you only see them on their terms. Always properly store, prepare, and dispose of food items when in areas with wildlife. It protects you and it protects them, making sure your experience in natural areas remains a positive one. captured with a box trap. One of the first things observers notice about the kit fox is its tiny size. 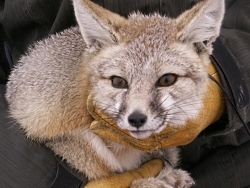 Weighing in at a mere four pounds or so, Vulpes macrotis is among the smallest canids on the planet. Often mistaken for swift foxes, kit foxes are a distinct species that sport larger ears and a leaner, more angular appearance. The small mammal has a long, black-tipped bushy tail and a yellowish-gray coat tinged with rusty orange. Listed as a sensitive species in Utah, the carnivores live primarily in the state’s arid, western regions, where they reside in family dens and hunt for smaller mammals such as field mice and jackrabbits, as well as insects, birds, amphibians and fish. But the diminutive hunter is susceptible to predation by a host of larger beasts, including coyotes, bobcats and golden eagles, says USU alum and wildlife biologist Bryan Kluever. “With small size comes disadvantages; however, the advantage is increased agility and mobility,” he says. Kit foxes have little difficulty leaping over sagebrush and rabbitbrush that towers over them and provides a welcome refuge from hungry predators. Given a choice, the foxes prefer to stay in open areas, where they can put their sense of sight to full use. Their vulnerability to larger members of the food chain partially explains the animal’s nocturnal habits. One of the kit foxes’ most distinctive traits is its insatiable curiosity. Thanks to USU’s Quinney College of Natural Resources for supporting research and development of this Wild About Utah topic. 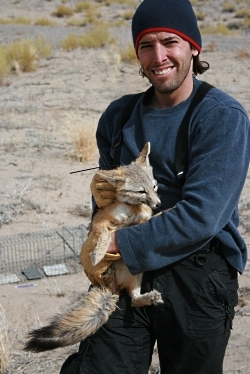 Bryan Kluever, wildlife biologist, Fort Carson Military Installation, Colorado.